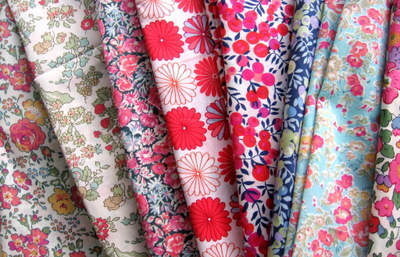 these fabrics always reminds me of my mom and me at the "Liberty" store in London when I was 15!! 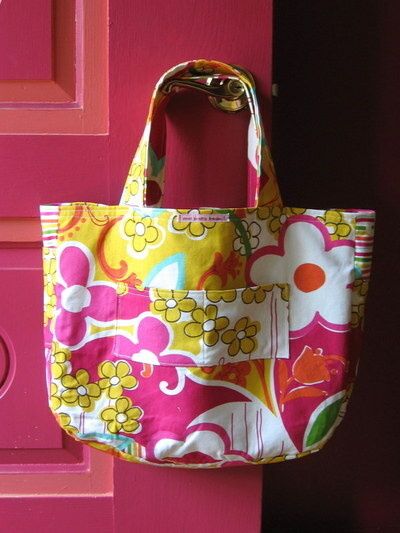 I used 2 different fabrics for the tote,with interfacing because the fabric is so fine, I love what came out and will be making some more this week to post on Etsy. I moved all my stuff in and have been using it for 3 days and it's so cuteeee!! I use interfacing here too and it I love the results! I made extra pockets on the sides and rounded off the bottom of the bag so it looks a little different and softer, boy was that a lot of work!!! I finished at 2am!!! but I made 2 of them and posted them on etsy (just sold one yesterday 6/26/07) yey!!! 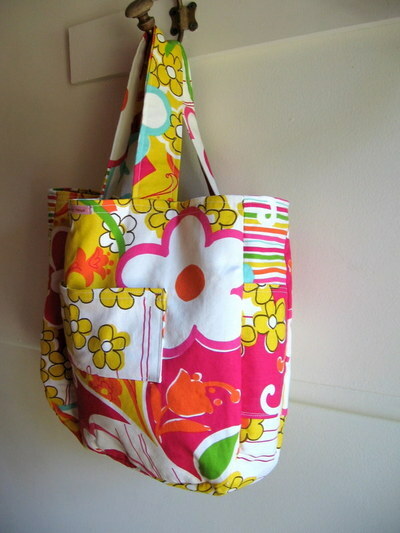 Hi, love your totes they are so colorful and beautifully made. Hi, I've just found your blog and love what you're doing. 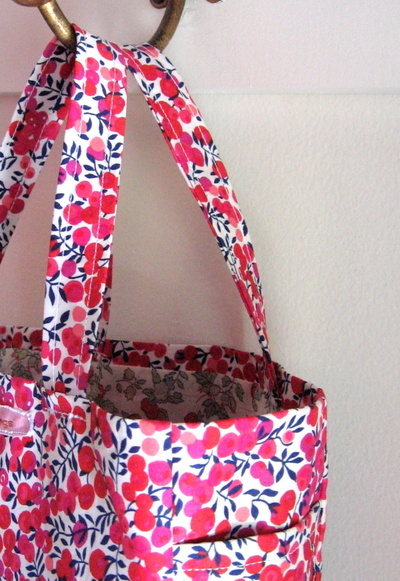 The liberty fabric with the little pink flowers is a bit like one I've been using to make some patchwork. Hoping to show it on our blog soon. The fresh fruit looks deliciious as well. We love being creative...sewing, baking and growing things, especially if we can also find bargains from charity shops. You're welcome to visit us at www.thehomelyyear.blog.co.uk. We'll keep visiting your super blog. How scrumptious! I love both the fabric and the design. Too bad (for me!) that they went so quickly on etsy! I just found your blog through delightfulblogs.com. I'll have to add it to my google reader! Keep up the lovely work. 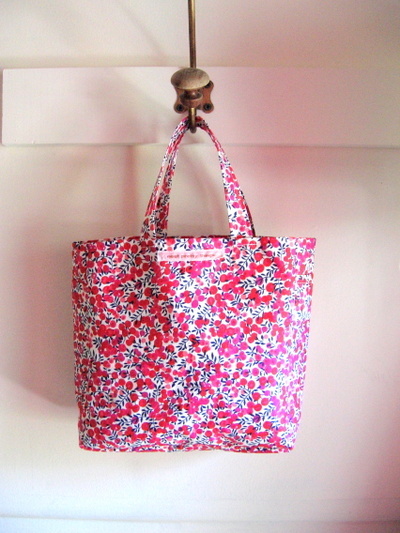 I LOOOOOOOVE Liberty of London, too! I collected it for years and one of my dreams came true twenty long years ago when I went to London and made the pilgramage to Liberty's. Heaven! I REALLY stocked up there! But like you have always been hesitant to use it! I made a couple of things out of Liberty in the '70s, which of course I can't wear now! I like the idea of making something that doesn't have to fit, so you can use it and enjoy it forever! Your bags are lovely and I may just have to order one so I don't have to cut any of my pieces up!!! Lovely totes! I really like the little slip pockets on the sides--what a great detail. hello, just wanted to say hi and to let you know that i work about 2 mins away from liberty and if you ever need anything from there, special fabrics or trims only available in liberty, i would be happy to get it for you and send it over.